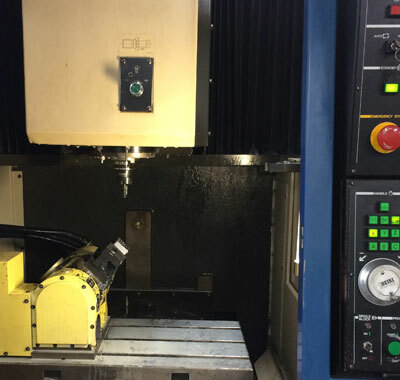 Our machine shop is well equipped to handle the manufacture of precision turned and milled components. We utilise 5 axis positional milling which enables us to machine 5 sides of a component in 1 single set up. This gives us a competitive edge when tackling components with tight feature relationships, that would otherwise be difficult if the part needed to be moved to another machine or re orientated by the operator. The machines also utilise touch probes for quick and accurate setting of work coordinate offsets and they also use on board tool length pre setters. We have the capability of cnc turning with 4 axis and live tooling. 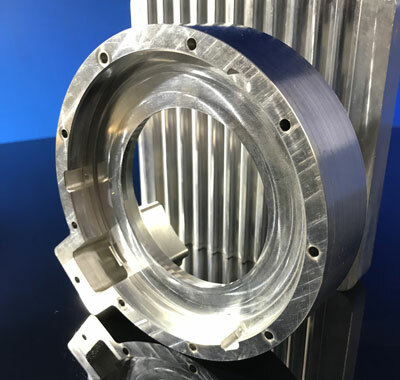 This means we can machine cylindrical components up to 250mm diameter and mill features in the X or Z direction without removing them from the machine. This is again, another way for us to retain dimensional relationships between features and also reduce cycle / processing times. Our hydraulic auto saw is another force multiplier, as we can set this up for repetitive cutting of billets in house which reduces the cost and lead time of buying in precut material and enables us to run and set machines while the material is being cut. We also use manual lathes, mills and drills for second operations and finishing/ polishing. Our capacity is suited to small to medium batch production. Typically ranging from 1 to 1000 off per component. One off production is suited to the confirmation of design and work flow. We typically produce single items so that the client can finalise features and tolerances, before committing to larger volume production.